St. Martin's Press, 9780312347499, 402pp. Jason Steadman is a thirty-year-old sales exec for a major electronics company in Boston. He's witty and well-liked but, to the chagrin of his ambitious wife, it looks like Jason's career has hit a ceiling. He lacks the one thing that could help him get ahead: the "KILLER INSTINCT "
All that changes when Jason meets Kurt Semko, a former Special Forces officer just back from Iraq. Looking for a decent pitcher for the company softball team, Jason gets Kurt, who was once drafted by the majors, a job in Corporate Security. Soon, good things start to happen for Jason and bad things start to happen to Jason's rivals. Too late does Jason discover that Kurt has been paving his path to the top by the most efficient, devious means available. Now that his new best friend has become the most dangerous enemy imaginable, Jason stands to lose far more than his job . 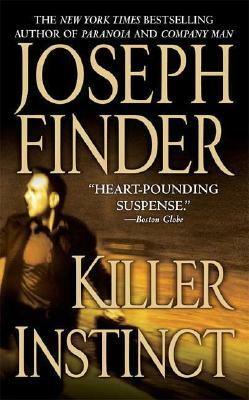 Joseph Finder is the author of several "New York Times" bestselling thrillers, including "Buried Secrets, High Crimes, Paranoia" and the first Nick Heller novel, "Vanished." "Killer Instinct" won the International Thriller Writers Award for Best Thriller, and "Company Man" won the Barry and Gumshoe Awards for Best Thriller. "High Crimes" was the basis of the Morgan Freeman/Ashley Judd movie, and both "Paranoia "and "Killer Instinct" are in development as major motion pictures. Born in Chicago, Finder studied Russian at Yale and Harvard. He was recruited by the CIA, but decided he preferred writing fiction. A member of the Council on Foreign Relations and the Association for Former Intelligence Officers, he lives in Boston, Massachusetts.